Our recycling’s rubbish at exam-time! Recently we held an exhibition to show how Library users can help fix an environmental problem in the Library. 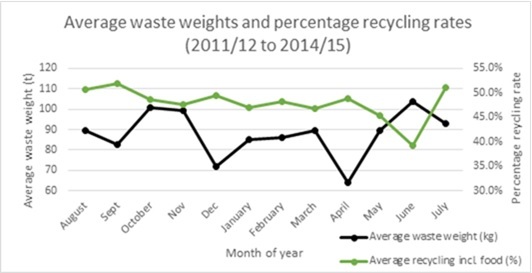 Statistics show that during busy periods, including exam-time, waste tonnage collected in the Library goes up but the percentage of recycling goes down. This is most obvious in the Group Study Areas of the 2nd and 4th Floors. putting used coffee cups in the waste bin! If our recycling company sees bin bags contaminated with used cups or drink dregs, they won’t take it – and the whole bag goes to landfill. Many people are unaware of this and would help if they understood. put recycling in the right bin. (The exhibition tells you more about which paper, metal and plastics we recycle here). Look out soon for our ‘roving slop bin‘, on test for University Estates & Facilities, coming to various parts of the Library soon. Is this bin type the solution to the problem of where to dispose of unfinished drinks before we bin the container? Let us know what you think below, or post your comments in the Sustainability Team Green Box(check out those googlie eyes!) beside the exhibition. For more news about this project, please contact the Library’s Environmental Champion, Sam Tyler. This entry was posted in Environment, Exhibitions, General news. Bookmark the permalink. I agree, big signs! people go about their day and forget simple basics like recycling. And it’s so important. Big signs threatening fines or even bans will have more impact than strategically placed recycle bins.